ACM Monograph Series: A Computational Logic focuses on the use of induction in proving theorems, including the use of lemmas and axioms, free variables, equalities, and generalization. The publication first elaborates on a sketch of the theory and two simple examples, a precise definition of the theory, and correctness of a tautology-checker. Topics include mechanical proofs, informal development, formal specification of the problem, well-founded relations, natural numbers, and literal atoms. The book then examines the use of type information to simplify formulas, use of axioms and lemmas as rewrite rules, and the use of definitions. Topics include nonrecursive functions, computing values, free variables in hypothesis, infinite backwards chaining, infinite looping, computing type sets, and type prescriptions. The manuscript takes a look at rewriting terms and simplifying clauses, eliminating destructors and irrelevance, using equalities, and generalization. Concerns include reasons for eliminating isolated hypotheses, precise statement of the generalization heuristic, restricting generalizations, precise use of equalities, and multiple destructors and infinite looping. 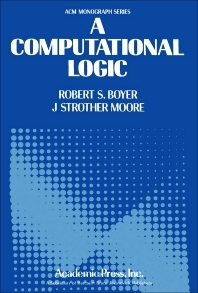 The publication is a vital source of data for researchers interested in computational logic. F. Artificial Intelligence or Logic?